It’s pouring! Oh rain, please go away so that we can play all day! So, how do you usually spend your time during a rainy day? Do you curl up under the covers and read your favorite book? Or do you watch the rain fall endlessly outside your window? To be honest, we would opt for the first option. 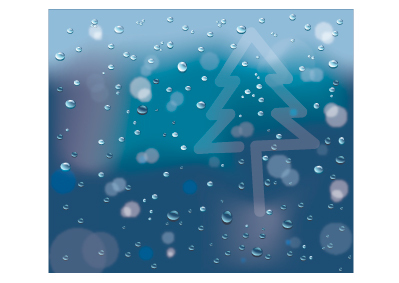 Speaking of the rainy weather, we’ll be teaching you how to create a vector graphic of artificial raindrops and a simple water vapor effect on a glass window. Don’t worry, it’s really simple and definitely easy to follow. Ready? Let’s get started! Create a new document in Illustrator or Photoshop with the following measurement – 25cm x 23cm, either CMYK or RGB. Set up a color group consisting of eight different shades of blue, as shown. Prepare multiple square shapes, with the same dimensions as your artboard, and fill the squares with medium blue color (from your color group). To do so, go to Object > Create Gradient Mesh, and enter six rows and columns. You can always add in more rows or columns if you want to. Manipulate the mesh point of the squares to create a distorted shape, turning it into an abstract looking background. Click each mesh point and color them with different shades of blue from the color group that we created earlier. Sketch a Christmas tree using the Pen Tool. You can adjust the stroke according to your personal preference and then, apply the Transparency effect. Now, let’s create some background lights effect to give it a more realistic look. Create a new layer and place it on top of the Background layer. Make sure that the Background layer is locked. Sketch as many circles as you like and arrange them in a random sequence. Fill the circles with a lighter blue shade and change the Opacity to 60% – 80%. Then, position the light shaded circles on lighter areas and transparent circles on darker areas. Apply the Gaussian Blur effect on all circles (Effect > Blur > Gaussian Blur) and set the radius to 4px. If you want to, you can also apply a Blur effect on selected circles (Blur: 6px). Lock the Circles layer and create a new one on top of it. Then, sketch an Ellipse and fill it with a four-stop radial gradient, as shown below. You can adjust the gradient so that the white portion appears at the edge of the Ellipse. Sketch another Ellipse (longer and slightly thinner) and fill it with the lightest blue shade, based on the color group. Go to Effect > Warp > Arc and apply the following settings – Style: Arc, select the Horizontol option, and set the Bend to 50%. After that, position the warped Ellipse on top of the gradient-filled Ellipse that you created in the previous step. Next, go to Object > Expand Appearance and adjust the Ellipse size (either bigger or smaller) in order for it to fit the raindrop. Apply a Radial Gradient on the highlight and change the Blending Mode to Screen. Here, check out the image below for a clearer illustration. Now, we’ll create the shadow for the raindrop. Duplicate the original Ellipse and fill it with a darker linear gradient. Change the Blending Mode to Multiply with an 80% Opacity. You can create two different types of raindrops, either with an original shade or a darker shade, by duplicating them. Then, adjust the gradients on each raindrop, however you like. We’re almost there! In this step, you can tweak or enhance the raindrops according to your preference. Then, arrange them in a random order and adjust the sizes accordingly. Lastly, bring everything together (the Christmas tree, background light effect, raindrops) and arrange them according to your own creative direction. Voila… that’s all folks! Wasn’t it easy? We really hope you enjoyed following this tutorial. The steps provided are simple guidelines for you. You’re free to apply the settings, as shown in all the steps above, according to your personal preference. Thanks for tuning in! Till we meet again in the next tutorial. P/S: For a larger and clearer view, please click on the images.